Jean-Pierre Gyhsels was born in Brussels in 1932, and is one of the leading Belgian sculptors of the 20th century. 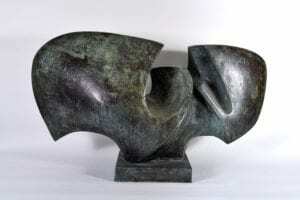 Ghysels is best known for his large bronze and copper sculptures in the lyrical abstract style. Although abstract, the artist insists that his art is still closely connected to nature. The curvilinear forms of his sculptures are inspired by wind, air, and the voids and spaces between objects, whereas the materials he uses (metal, clay, wood) come from the earth itself. The free-flowing and Interweaving forms create a sense of harmony and balance. Their complex spatial projections invite the viewer to walk around and experience them from many different angles. Ghysels was a creative child, and spent his free time drawing and sketching. He later attended the Maredsous Art School, where he studied sculpture and received his degree in 1953. Ghysels then received a prestigious grant to study sculpture in Paris, which proved to be a very formative experience in his early career. 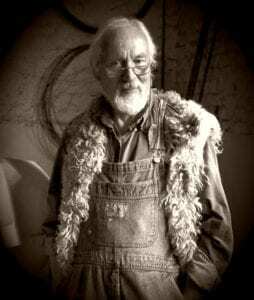 He then received a travel grant for sculptors that allowed him to travel throughout the Middle East and Asia, where he became inspired by the native styles of those regions, especially by their metal jewelry and decorative art. After returning to Brussels, he set up the studio where he continues to work today. Although trained in a more traditional style, the artist broke away from realistic forms and turned to abstraction in the mid-1960’s. In that decade Ghysels took part in many group exhibitions, and had his first solo exhibition in 1966 in Brussels. Many solo exhibitions followed in various countries, including France, England, and the United States. His sculptures were chosen several times to represent Belgium in the World’s Fair, and he exhibited his work numerous times at the Middelheim Open Air Sculpture Biennale. Ghysels’ sculptures now reside in public and private collections throughout the world. In 1971 the Hyatt Corporation commissioned a 15-meter tall copper sculpture for their headquarters in Chicago. Many other major corporations have purchased his sculptures, including Deutsche Bank and ExxonMobil. His sculptures also reside in various government embassies and public spaces. A monograph entitled “The Beauty of Space” was published about the artist and his work in 2007, affirming his importance to the history of modern art. Jean-Pierre Ghysel’s sculptures are inspired by the natural world and the human experience in it. He compares his creative process to childbirth. The initial idea for a sculpture develops and grows for months, and he never knows exactly what the finished work of art will look like. He begins with a model in clay or plaster, which continues to evolve and be transformed many times during its creation. Each finished sculpture seems to resound with energy, as if they have a life of their own. Some compare them to limbs breaking free from a body, pushing outwards into space. Each of Ghysel’s sculpture is the result of a long process of conception and design. Each is unique, yet embodies his own recognizable style.